Five-star beverages, fast and friendly service, and a warm, welcoming atmosphere are just a few of the qualities that make South Lyon Biggby customers leave the store in a better mood. 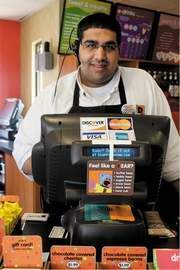 On May 5, the South Lyon Biggby Coffee will celebrate one year of hard work, successful sales,and faithful customers. “South Lyon has had a great first year and continues to grow and prosper,” said Bob Fish, CEO and co-founder of the company. the grand opening last May. as different, but I am proud that our store made it. regular basis. I am here over 60 hours a week. business would not be successful. brighten the day and deliver tasty beverages. 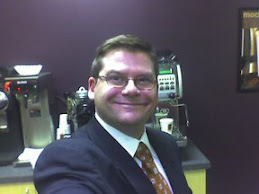 Frank Morabito, a true Biggby fanatic. caramel, caramel apple cider, and the butter bear. mouth-watering and delicious,” joked Khetarpal. land he owns next door to Biggby. experienced, and willing to improve. “It feels good to see that my hard work has paid off. 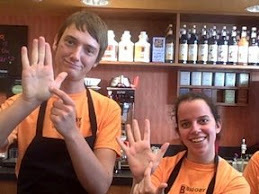 Nice work South Lyon BIGGBY, and happy 1 yr anniversary! Happy 1 Year - GREAT job!!! The South Lyon team is awesome! Nishant: Happy One Year! South Lyon customers are lucky to have such great people making their morning coffee and you and the baristas are lucky to have such great customers - they love you guys and share how much they do by sending in positive feedback! Keep up the great work!!! Way to go Nishant. was in your store a few weeks ago and had an AWESOME experience. GREAT interview, Nishant! Nice to see you, Ray, and the rest of the team getting some press about all of your hard work over the past year, and the gains that you've seen as a result of it--keep it up! Nice seeing you this week and thanks for all of your hard work. I live near Alma and am very much looking forward to having A Biggby closer to home!! Congrats on your one year anniversary...Hope to meet you when you come to Alma.